On a quest for perfect winter handwear for this environment… Photo: Paul Kirtley. In cold environments, a very good set of mittens is essential. A truly good set of mittens is hard to find, though. There’s a lot of tat on the market. Plus mittens that are ideal for one type of environment or activity are not necessarily ideal for another. For a long time I was looking for my ideal set of mittens for winter trips in the boreal forest. Over the years I’ve tried a fair few different models of gloves and mittens, combinations of liners and outers and different materials – leather, nylon, Ventile, Gore-Tex and other breathable membranes, wool (Dachsteins, Lovikka, Ulfrotte and other terry/pile stitches), synthetic pile and Primaloft. I’ve never quite found any combination perfect for my needs. In the Hestra Bivak Mitts, however, I think I’ve found the perfect set of mitts. In the Bivaks I’ve found a component of the nearest I’ve come to a perfect set of mitts for my winter camping trips and work with clients in the northern forest. This arrival required the combination of two products. But before I tell you more, let me explain a little more about what I was looking for and why. The particular criteria I was looking for this set of mittens to fulfil was determined to a significant extent both by the conditions of the environment and by the activities undertaken there. Specifically, I needed a mitten for winter use in the forests of northern Sweden while undertaking winter camping trips. This would primarily be on foot with snow shoes and toboggan, staying in heated tents but it might also involve skiing and staying in bivouacs or cabins. My time in the north also sometimes involves driving a snow machine/skidoo or dog sledding. The mitts needed to have excellent performance in the low winter temperatures of the arctic forest. This would mean excellent thermal performance in terms of insulation as well as their fit. Restrictive clothing reduces circulation and this effect is particularly observable in the extremities. Loosening a bootlace which is a little too tight can make the difference between warm and alarmingly cold toes. Well-adjusted, good fitting mittens can also make the difference between warm digits and losing feeling in them. Performance in severe cold also means good breathability, so that perspiration can escape. Many people think this means the glove must have a modern breathable membrane. In extreme cold, modern breathable membranes are actually a hindrance. The great benefit of these fabrics is that they are highly resistant to atmospheric moisture coming in from the outside while being able to allow water vapour out from the inside. This doesn’t mean they are as efficient at letting moisture out as no membrane at all. They certainly aren’t. Moreover, if water does not remain as vapour before it can pass the membrane, it won’t. This leads to a build up of moisture inside the garment. In really cold environments – when it gets down to around the temperature of your home freezer – breathable membranes don’t really work very well at all. Water condenses or even freezes on the inside of the membrane and the moisture stays inside. Also, in really cold environments, the environment is effectively freeze dried. You are not going to get wet from precipitation and snow on the ground is not wet. So, you are better off without a modern breathable membrane. Ventile or leather are much better for example. You also need to be able to rid mittens of any retained moisture on a daily basis while out on a trip. A build up of moisture within handwear with multiple, integrated, inseparable layers can be a serious issue in very low temperatures, as moisture becomes trapped within the structure of the glove. You must be able to easily dry out any glove when the opportunity arises. The most efficient way of doing this is being able to take the glove apart – i.e. separate the component parts. The same principle applies to your footwear – the liners as well as the insoles should all come out and be separable from the shell. The other allied benefit of being able to separate liners from a shell – whether boots or mittens – is that you can carry spare sets of liners. Setting up camp. Photo: Paul Kirtley. 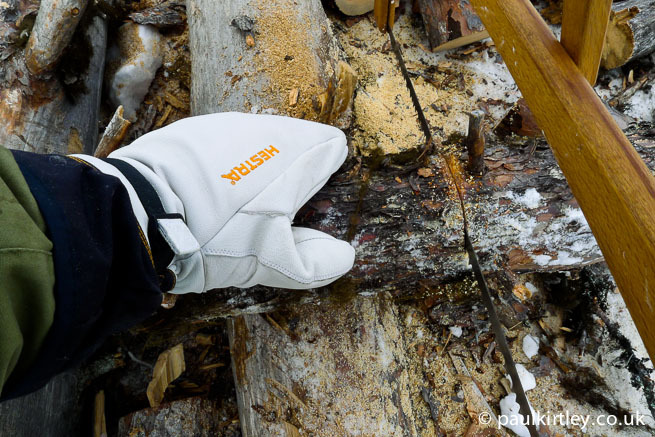 Handwear for winter camping trips in the northern forest also needs to be durable. 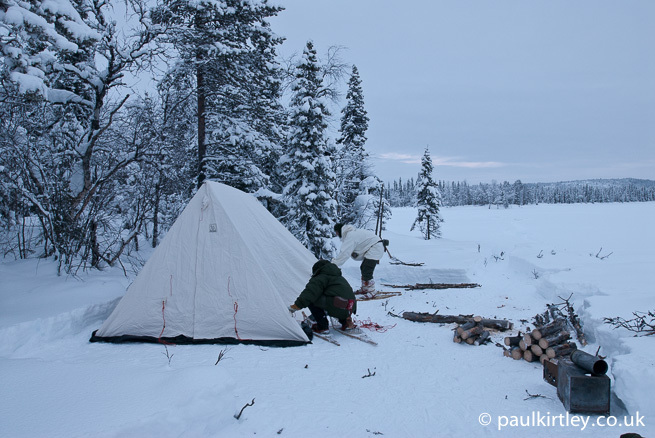 Winter camping trips necessarily involve handling equipment such as stoves and canvas tents in cold conditions while setting up camp. Logs need to be transported and processed into firewood. Toboggans need to be hauled. Wear and tear on gloves can be significant. So any handwear needs to be suitably durable. I don’t make a habit of handling hot objects while winter camping. There is a risk of personal injury, as there is anywhere else. In a cold environment, burning yourself, particularly if it causes a blister, also leaves you more susceptible to cold injuries in that area. That said, winter camping seems to involve quite a lot of hot objects, not least stoves. Being able to put on a glove and nudge a stove door handle that is a little too hot for bare hands is a useful extra piece of functionality. Furthermore, if you are bivvying and using a fire for warmth, for cooking, etc., then you will necessarily have your handwear on most of the time as it’s cold out there. Your gloves and mitts become your second skin and you get used to doing everything around fires wearing your gloves in the same way you would in warmer climes without gloves on. I don’t like plastic gloves for winter trips for this reason alone. They are too easily damaged by heat. A significant amount of leather on at least the fingers and palms is a solution which is much more resistant to heat. Winter handwear needs to be durable. 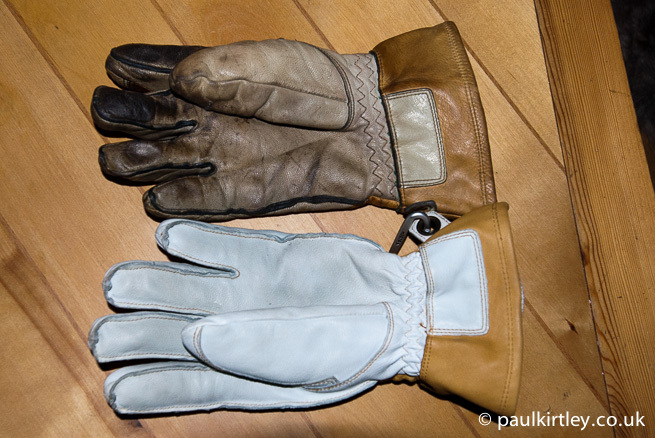 Top is one of my Hestra Fält Guide gloves after several years of use; Bottom a brand new glove (the slight discolouration of the new glove is due to treatment with Hestra Leather Balm). Photo: Paul Kirtley. UK winter conditions which require gloves are typically wet and/or windy. Even when it is snowing, it’s often quite wet snow that we receive here. If you get your hands in the snow – such as during winter mountaineering activities – gloves need to be highly resistant to moisture. Good quality gloves and mittens sufficient for such conditions are often not best suited or to the dry, severe cold of the arctic. The nearest I have to something that would be suitable for the northern forest in winter are a set of Dachsteins housed by an old set of late 90s/early-2000s vintage Extremities mitten shells made of a tough polyester material. These, along with two pairs of Mountain Equipment Guide gloves form the mainstay of my winter hillwalking/mountaineering handwear outfit. Something different is needed for the arctic forest, though. The mittens I have been using in the north are a pair of surplus Swedish military leather mitts with Lovikka inside. 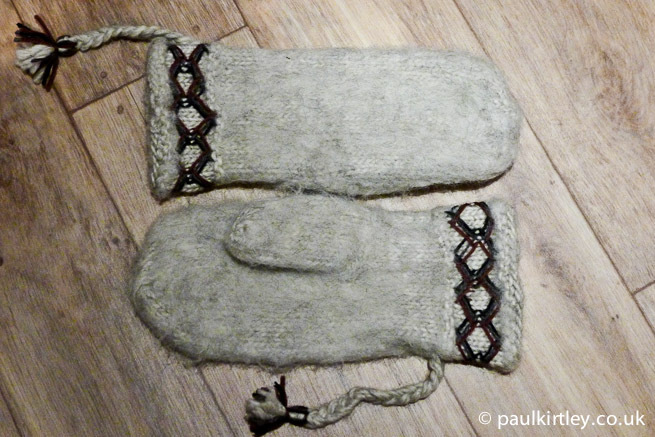 Lovikka are traditional, hand-knitted wool inner mittens. 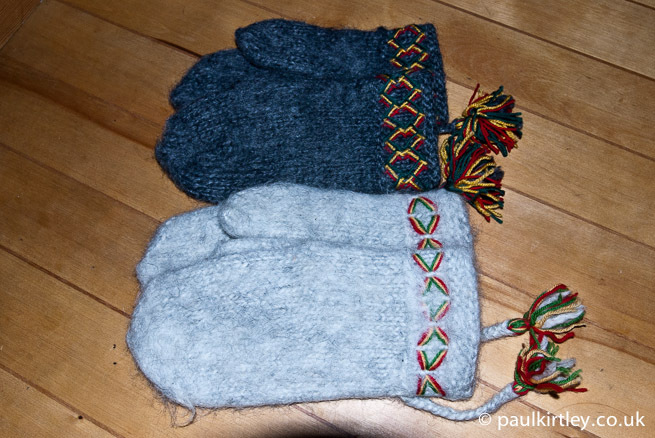 Lovikka: Hand-knitted mittens from Sweden. Photo: Paul Kirtley. Lars Fält loved his old set of leather mittens and Lovikka, which fit like a pair of old slippers. Working with Lars provided a perfect opportunity to model what he did and used in that environment. So, I persevered with my army surplus leather mittens. I loved the warmth of the Lovikka I’d put inside but there were several things I disliked about the set of leather outers I had. One was the stiffness of the leather – I felt like my hands were turned to flippers whenever I wore them. I had virtually zero dexterity while wearing them. The second issue was the interface with my jacket sleeves. With the Lovikka inside, it was hard to get my jacket sleeves over the cuff of the mitten and sealed. I could manage it on one hand by taking off the other mitten but even employing my teeth, I couldn’t manage it with the other one. Part of the issue here was the first problem – dexterity – the other was the shapeless mass of leather. Third, the gloves are quite short, which means even when they were inside my jacket sleeve, they would often come out when I extended my arms in certain directions. If the mittens had some sort of snow-lock cuff, I could have worn this on the outside of my jacket sleeve and sealed it by closing the snow lock but alas they didn’t have one. Finally, there is an attempt at an adjuster at the wrist but it doesn’t really do anything. This design is from the 1960s/70s and people who grew up with them no doubt accepted them (anything is better than frostbite) but I guess I’m of the generation which started with basic outdoor gear but has grown to expect more technical solutions as clothing manufacturers have innovated. I persevered with these mittens on and off for eight winters, interspersed with trying other solutions. Every time I came back to these mittens, I loved the Lovikka but the leather outers just frustrated the hell out of me. Hestra is a Swedish company named after the town where it is headquartered and has been manufacturing gloves since 1936. Hestra is one of the world’s leading glove brands. The majority of its sales are in Scandinavia, Alpine countries, the United States and Japan. I was introduced to Hestra gloves while working in Sweden with the doyen of Swedish survival training, Lars Fält, after whom Hestra’s Fält Guide Glove is named. Hestra definitely understands handwear. The company understands different gloves are needed for different activities and even for different levels of performance within a particular activity. For example, novice skiers make different demands on their gloves than do national ski teams. Hestra also understands different materials have different properties, which are better suited to differing demands. Some are more resilient, some are more supple, some are more breathable, some are more resistant to moisture. So, Hestra manufactures a lot of different models of gloves to suit different needs. 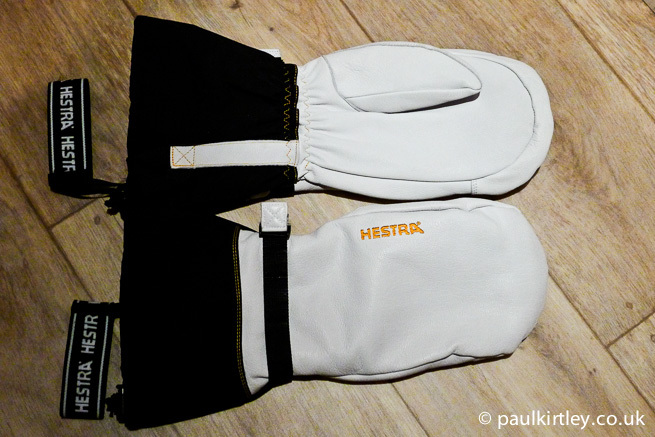 In fact all Hestra makes is gloves, producing over 2 million pairs per year. All of them are very good quality. This is great for anyone who wants gloves. Hestra: Many models of high quality gloves and mittens. Photo: Paul Kirtley. If there is a difficulty with Hestra gloves, though, it’s knowing where to start. Hestra’s website and print catalogues do a nice job of dividing up the product lines into areas such as ‘Alpine’, ‘Alpine Pro’, ‘Cross Country’, ‘Mountaineering’ and ‘Horse Riding’, for example. Moving away from these more specialist areas, the gloves and mittens that many readers of this blog might be interested in all fall under the more general heading of ‘Outdoors’. 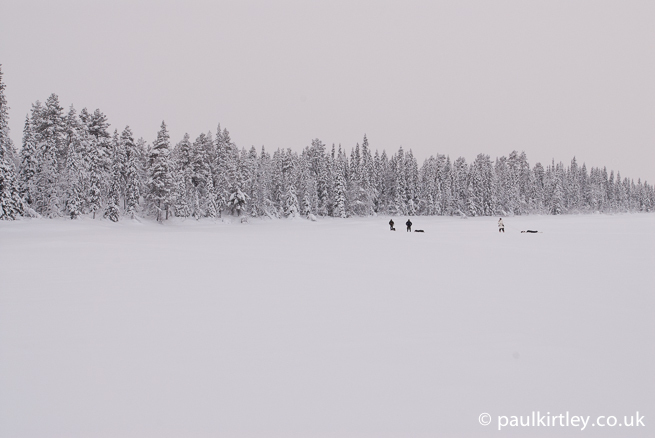 After one of our winter trips in the north of Sweden, we stayed in Stockholm before travelling back to the UK. Just off the eastern end of the lengthy Kungsgatan, in one of the main shopping areas of the city is Norrlandsgatan. Located here is the Hestra Concept Store. If you want to survey Hestra’s product line-up, this is the place to come. 300+ models of gloves in a wide variety of colours and sizes. It’s like an Aladdin’s Cave of gloves. If you had a glove fetish, you might never leave. Here I was able to inspect, handle and try on all of the mitts I was interested in. In particular I was able to check out the Ecocuir Ventile Mitt, the Kebnekaise Mountain Mitt and the Bivak Mitt. The Ecocuir Ventile Mitts are lovely. In a rugged kind of way. I like Ventile and I like the durability and heat-resistance of leather gloves and mitts. There is something very traditional about the combination of leather and Ventile. I’ve used 100% Ventile mittens before but didn’t like how they gripped on the fingers/palm (a little slippery) and the particular model I was using was a little restrictive around the thumb once I had a decent sized liner inside. The Ecocuir chrome-free cowhide palms are soft, supple and ooze quality. These are modern mittens that have a classic feel of yesteryear. The one thing that put me off was the leather. As nice as it is (and it’s very nice), it isn’t the toughest leather that Hestra produce; my concern was that if I was to be handling metal stoves, carrying logs, etc., then I wanted something as robust as possible. Next up in the mitten parade, then, was the Kebnekaise Mountain Mitt. These mountain mitts are named after Sweden’s highest mountain. They are good quality mountaineering mitts with an army leather palm and a durable nylon back and cuff. The leather is not as supple as the Ecocuir but it is much more supple than my old 1970s Swedish army mitts. While the Kebnekaise mitts don’t invoke the same sepia-tinted romanticism as the Ecocuir Ventile Mitts, they were a very practical potential solution. They were also less expensive. 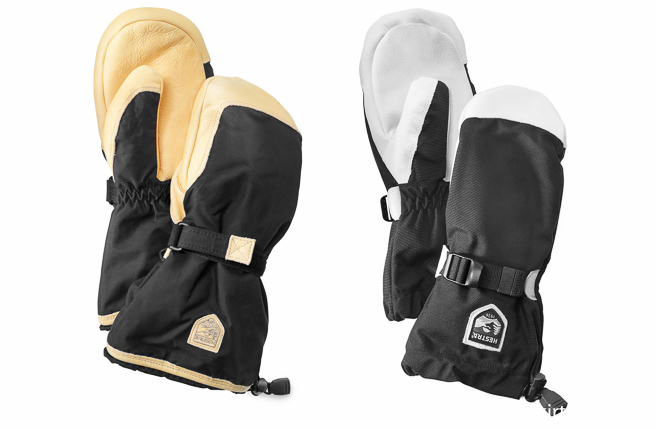 Hestra Ecocuir Ventile Mitts (left); Hestra Kebnekaise Mountain Mitts (right). Photos: Hestra. Composite: Paul Kirtley. Third, I tried the Bivak Mitt. These immediately impressed me with their seeming acres of white Army Leather that make up the majority of the mitten. Apart from the nylon snow cuffs, the entire gloves are made up from Hestra’s toughest leather. While I had liked the practicality of the Kebnekaise gloves, the thing that I was worried about with them was the polyamide material on the back of the glove – while the leather would be pretty resilient to heat, the synthetic material would be no good if it came into contact with hot stove parts or flames. The Bivak Mitts instantly won out over the Kebnekaise Mitts on this front. So it came down to a choice between the Ecocuirs and the Bivaks – both well made of high quality materials. In the end, the Bivaks won on the toughness of the leather. My Hestra Bivak Mitts when they were new. Photo: Paul Kirtley. In terms of sizing I went for 11. I’m normally a 10 in gloves but I wanted a bit more room in these, not least so I could pop in some thicker liners. All of the above three gloves come with removable Hestra liners. These liners are made of wool pile and wool terry cloth. Compared to Dachsteins or Lovikka, they are quite thin. I believe this is so you can wear the mitts as a shell layer over your normal gloves – what Hestra call “base gloves”. Hestra mitten liners. Photo: Paul Kirtley. I didn’t want to use this system, however, for a number of reasons. First, my normal winter camping finger gloves for dry, cold conditions are the Falt Guide Glove, which are quite bulky. They are also often a bit sooty/dirty after handling the stove and chimney assembly for the heated tent when setting up camp. Dirt reduces the performance of insulating layers so I didn’t want to be introducing significant amounts of soot inside my mitten liners. At other times, the Falt Gloves can be a bit iced up on the outside and I don’t want to be putting moisture inside my mittens either. More important, though, I want a mitten system which is independent of my finger gloves. There is more redundancy in such a system. So, I wanted my mittens to be a complete solution – as they had been before. Falt Guide Gloves would come off and the mittens would go on. Hence I wanted to have a decent thickness liner inside the mitt, without it being compressed or my hands being restricted. The plan was to remove the Hestra liners and add some hand-knitted Lovikka, which I’ve used for many years and found excellent for very cold conditions. The set of Lovikka to be paired with the Bivaks. Photo: Paul Kirtley. So, in exchange for the Bivak Mitts, I parted with a wad of Swedish Kronor notes, equating to around £100 of my hard-earned British Pounds. Adding the hand-knitted Lovikka for around £45, the total cost of this solution was approximately £150. 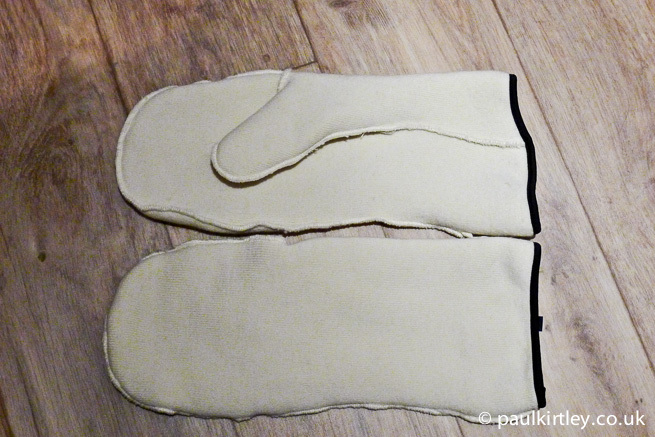 I bought the mittens in early 2012; only now am I writing this review, nearly two years later. I don’t believe in “reviews” of brand new products that have never been tried by the author. You have to go out and use things. Try them in different conditions and make them part of your outfit, your routine, your set-up. You have to get to know an item and its strengths and weaknesses. So far, this combination of items – Hestra Bivak Mitt outers + Lovikka – has served me very well. 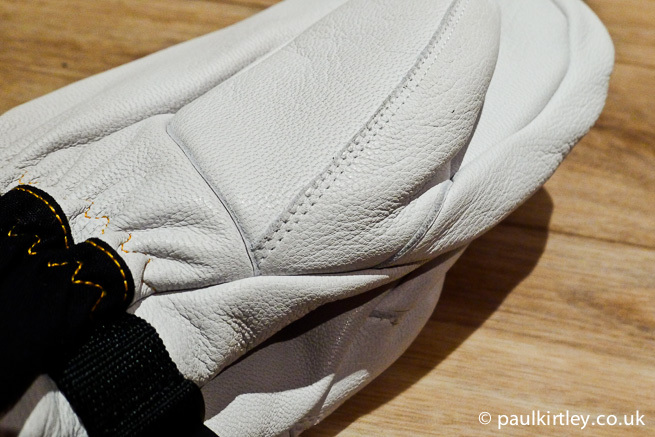 When new, the gloves certainly look well-made, with quality materials and good, tidy stitching. So, far I have had no trouble with this aspect of the mitts – no fraying or loose threads or similar. The leather itself is tough yet supple. Mittens are obviously an important piece of winter clothing on which the ability to use one’s hands and, therefore, to stay alive in cold environments depend. So, I haven’t abused these mitts but I have used them as and when I’ve needed to in not too precious a fashion. I always had my old mittens with me on trips as back-up anyway. The treated goat leather is effective in repelling moisture, for example from wet snow and water when ice fishing. 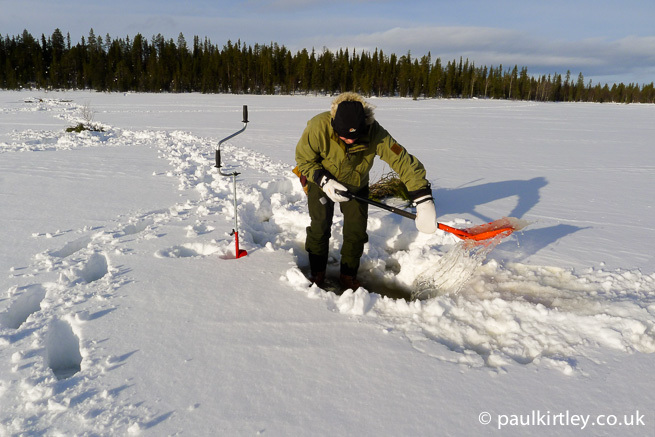 Wearing the Bivak Mitts while setting up ice fishing holes. Photo: Stuart Wittke. The suppleness of the leather allows for much greater dexterity than with my old leather mitts. One quibble here is that, in retrospect, I think I probably would have been OK with the size 10 mitts. The 11s sometimes feel like there is a little too much “real estate” around my fingers when I’m trying to do things with the mitts on. Overall though, I’m happy as I’ve never had cold hands in these mitts and if my fingers have been a bit chilly while wearing finger gloves, switching to the mitts has soon allowed my digits to warm up. That’s the power of the Lovikka in particular. I’ve had no issues with moisture build-up on the inside of the mittens. In fact there is very little sign of any moisture after using them. Of course the wool inner mittens help with this too. Good dexterity allows easy control of a bucksaw and logs for firewood. Photo: Paul Kirtley. The snow lock is a dream to use. I can slip the mitten onto my hand, easily pull the cuff over my jacket sleeve then tighten it with the shock cord to seal it, thus allowing snow or spindrift no easy way in. They are very cosy. My only negative point about the Bivak outers is that the quick-release buckle which secures the strap adjusting the fit at the wrist does not always stay fastened. I find it a little strange that each of the three Hestra mitten designs mentioned in this article – Ecocuir Ventile, Kebnekaise and Bivak – all have different fastening/buckle systems on the wrist adjustment. I would prefer the fastener of the type on either of the other two mitts compared to what is on the Bivak mitt. That said, I don’t use this adjustment very much as the wrists are a little elasticated plus the Lovikka are quite fat, so there is not much excess to take in. To some people a mitten solution costing £150 might seem expensive. I think most of us would, however, put a much greater value on our hands than £150. The question, then, is not whether it is worth spending £150 on protecting your hands but whether you could protect them just as well for less. You can certainly find cheaper solutions. The old military mitts of the type I used can still be picked up for around £10 (try EBay). Some Dachsteins will set you back around £24. So for about £35 you can get a budget solution that works very well. A subsidiary question is whether the cheaper solution is the optimal solution given how much time you spend in the environment. Long ago I upgraded to Lovikka. I find them more comfortable and warmer than Dachsteins (although they are not as tough or impermeable to snow and must be worn inside an outer shell). The whole point of this quest, which ended up in my purchasing the Bivak Mitts, was a desire to upgrade away from the shortcomings and personal irritations of the old 1960s Swedish military mitt design. In working with clients in the North, I need to be always in a position where I’m able to help people I’m there to guide and look after. The cold is a hazard to everyone in a group. I need my gear to be utterly dependable. 5 or 10 per cent difference in performance could make the difference between me being preoccupied with my own wellbeing rather than being 100% present, aware and available for helping my clients stay safe in an environment they are unfamiliar with. For my purposes the Hestra Bivak Mitts with added Lovikka is a highly effective pairing of top quality products that is ideally suited to my needs. My desire was to have a solution which not only performed well in a dependable way but also one that is durable and promises consistent performance for a long time to come. So far these mittens have proven to be the solution I needed. I’m confident, based on their performance so far, they will continue to be. I spend enough time in seriously cold environments every winter – both professionally and for leisure – for this investment to be a no-brainer. For the time being I have found as perfect a set of mittens for me as I can. For those in the UK who are interested to try the M90 mitts, there are some available here. Thanks for the tip Johan. Yes, I agree – hands and feet are the hardest to dress. Interesting you use the N-4B mittens. They look interesting but I’ve never had the opportunity to try them. What temperatures have you used them in? The Falt Guide Gloves are my workhorse gloves and stand up to a lot of wear and tear. In this respect, get the white & tan version rather than the black & brown as the leather seems to be thicker/tougher. When you do get a pair, definitely get a spare set of the wool liners so you can swap them out during the day if you need to. One of the few items of clothing from my time in the Norwegian Army both me and army has kept was the mittens. Ours was a wind proof outer mitten in cotton that goes half way up to the elbow, and a long wool mitten inside. It even got a trigger finger, excellent for using a camera on a tripod with a cable release. The only thing I wish for is the new outer glove, whitch now is a membrane material. This as out her on the islands, we mostly get wet snow. So the outer cooton mitten I have gets wet during the day and freezes to ice when the sun goes down. For warmth this sis seldom a problem however as the wool inner mitten still does the job of keeping me warm. It can be a bit difficult to get both on right, like you describe. Bit it’s doable, and does not represent a big problem. Probably becosue the cotton is much softer than the swedish leather. I have a set of Canadian military duffel-lined mitts that I bought from Craig MacDonald (Odawban Equipment) that work well for me (RR 1, Dwight, Ontario, Canada, P0A 1H0). I have also tried US military types as well as expensive Lowe Aline Primaloft winter gauntlet-types. Both are inferior to the white leather/canvas types with removable duffel (wool ) that I found on the internet here, as well –>http://armyissue.com/catalog/product_info.php/products_id/1955. They key is that the liners can be removed and dried at night in the heated tents that I favor in Maine (USA). Great article there. I have been an avid wearer of winter mitts for 25 years now for various reasons from tendon damage to loosing a finger. They allow me to get them on and off much easier than a glove. I still wear fingerless gloves inside the mitts in case I need to remove them. I also find that keeping the fingers together instead of seperate helps with warmth. Even so I can’t justify 150 on a pair of mitts, but saying that I never get anywhere that would put me at risk of extreme cold. Another good read Paul and looking forward to many more. Hey Paul! That’s a great article about gloves and mitts. Recently, I saw LesStraud (yes, I watch Survivorman) ; I don’t know what mitts he was wearing in Alaska, but the interesting thing was how he used cordage to tie his mitts over his neck. He must have learned this from the Eskimos and I thought it was a good way to prevent losing these essentials. Every kid in Norway wear them like that. We The string goes from one mityten trough the arms of their jacket around the neck and down the other arm. I still wear my moose hide mitts that way. It makes it handy to remove the gloves for fine dexterous work, and the gloves are not lost in the snow. You can walk around with say a compass in hand while the glove dangles nonchalantly at your cuff, or take photos, etc. Extensive review about mittens. I have several different mittens and gloves. I agree that leather is the only way to go when working with fires and handling hot objects. A meltdown of your gloves or mittens is terrible. I have even had meltdowns of my jackets…bummer. I use large horse blanket safety pins and pin the mittens to sleeves of my coat. Ah, OK. Interesting solution. Thanks for sharing! Leather and cotton all the way for outers…. I have never experienced in my life something like that you report. As a matter of fact, I didn’t even know what were mittens before reading your review about handwear . Anyway, it made me to remember something which happened 38 years ago when I tried to put chains on the tyres of my small car because of the thick snow on the road. As I was inexperienced I get out of the car and took the chains out of the trunk. They were still in their package. Without gloves in my hands I did not even manage to have them out of the package…. I’ve worn these for 30 years. Great mitts. I’d like to see a photo of your mitts when they are a bit more lived in. Those moosehide choppers look nice – and a great price too! I’ll post a more lived in picture of my mittens. They are no-where near as well worn as my finger gloves though (which pretty much need replacing now). I live in Northern Minnesota, “the Arrowhead Country”, where I snowshoe in the boreal forest everyday in winter. My mitten solution was very similar to yours; oversized insulated leather mittens with my own woolen mittens as additional liners. These have worked very well except in situations where I have chosen to sit too long without a tea fire. Thank you for the article and links to sources for mittens. I don’t see $150 for a set of mittens as any expense at all if it means warm hands or saving my fingers. Hey Paul thanks for the review and I couldn’t agree more about the trial and error too many know it all companies hire morons to test for a week or month at the most and request almost instant approval to sell sell sell. But what differences did yo intend to find between the sami who have used and adapted their clothing type since forever especially when their clothing works as you said at whatever the cost. Or is it because there are so many rules and laws out now that you feel more comfortable exploring what ever alternative you can muster? Hi Paul, what do you think of Norrona’s glove/mitten offerings? Hi there, I like Norrona clothing in general. All of the items I own from the brand are well made of good quality materials. I have not used any of their mittens though. I have looked at their synthetic outers in stores in Norway and they also look well made. I do have a set of Norrona ski gloves, which are very nice and work well for their intended purpose. They have a Primaloft fill, Pittards leather palms and pre-curved fingers. I like them a lot. But they are my only experience of Norrona handwear. Interesting how basic concepts hold. As a mechanic in Michigan (USA), liners in a leather shell have worked well for years for winter use. Battery acid (sulfuric), grease, and wear will kill any handwear all too soon. GOOD handwear beats frostnip EVERY time!! Excellent article!! I use welder’s gauntlets with a liner to do work in winter. These work quite well for dexterity with the saw and axe, and if I get sweating, I switch to fitter’s gloves as they are insulated and not as bulky. They are typical gloves used for welding and insulate well against heat or cold. They are available readily at work supply stores in Canada for a reasonable price, and are durable. 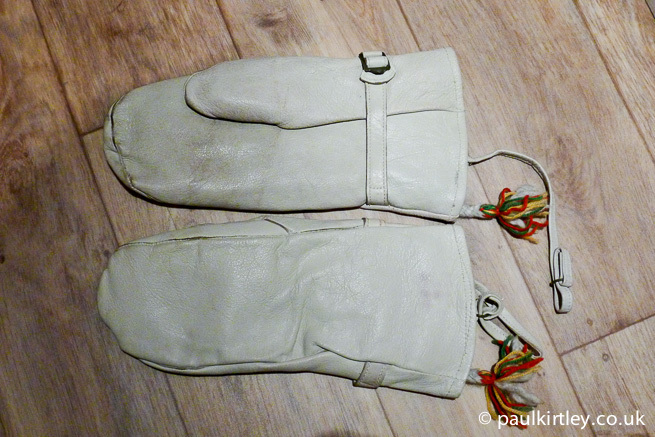 For just walking about, I am fortunate to have native made leather mitts with wool liners. I tie a string to them which goes through my sleeves and around the interior of my coat. A couple of cheap, small carabiners clips them to the cordage. This way, like the Inuit (Equimos), I can slip them off to handle tasks, light a fire, or pick cranberries with bare fingers, then slip them on again without putting them down. Thanks for your thoughts. I spend years to find the perfect solution for my cold hands; glove and mittens. I whore different types of army gloves and mittens from Austria and Poland as well technical gloves for example black diamond. This winter I added to my buffalo special six, the buffalo mitts. What a dillight ! Although there must handled with care causes the fabric I love the instant warmth of these. They are light ,compact not bulky and give you the ability to crap even the small zipper tacks of the buffalo shirt. I really enjoy reading your great blog. I wondered whether you had a good place to maybe be able to purchase some Lovikka mitts please? I have looked online and when in Denmark too (I thought more likely to maybe have some than the UK), but have not happened to see any as yet. Hi Paul, thanks very much indeed. I have emailed you through the site to give contact details. My mother never had any trouble finding the Lovvika mittens. I grew up wearing them. I never felt the need to layer them with other mittens either. 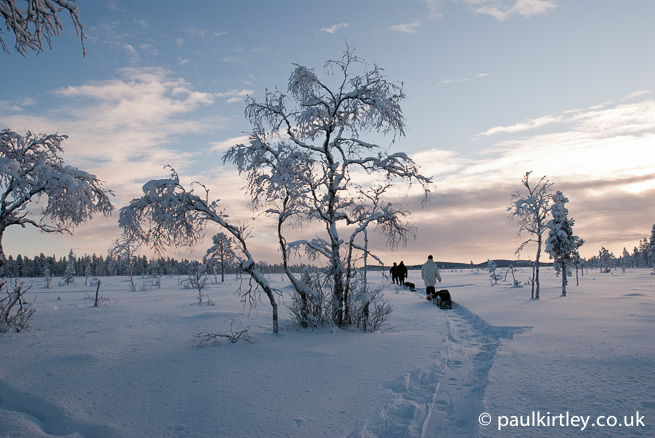 I spent half of my childhood just south of Lapland and many vacations in Lapland in the winter. My hands were never cold. My teens were spent in the southern part of Sweden, and the mittens were readily available even though it never got quite as cold down there.